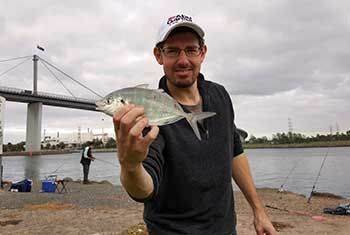 Myself & John Regali fished under the West Gate bridge and quickly started ripping into many Pinkies who were eagerly taking small pilchard strips on a basic paternoster rig. In our 3 hour session we managed 15 Pinkies, 3 Bream and 1 Trevally. We left west Gate and moved onto Canning street it didn’t take too long for the Bream to start biting. Using Scrub worms and Maggots on very light gear we continually caught Bream between the 15cm to 25cm in size. We fished here for 3 hours ended up with a heap of under size Bream and 4 Bream over legal size. All released to fight another day.